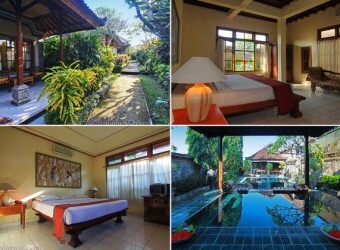 Bali Hotel A deluxe type has the kitchen, and it can be used as the long-term stay. It is the hotel of the family-like atmosphere that is comfortable as staying in own house. Because there are an art shop, Ubud Market, an art museum, a bank, photo shop, a gallery near Monkey Forest near the center of Ubud, so you can go out and fully enjoy walking around.